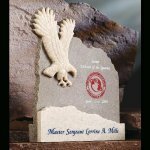 Stonecast moonstone colored backer makes a freestanding plaque that is accented with sandstone mountain silhouette and eagle. 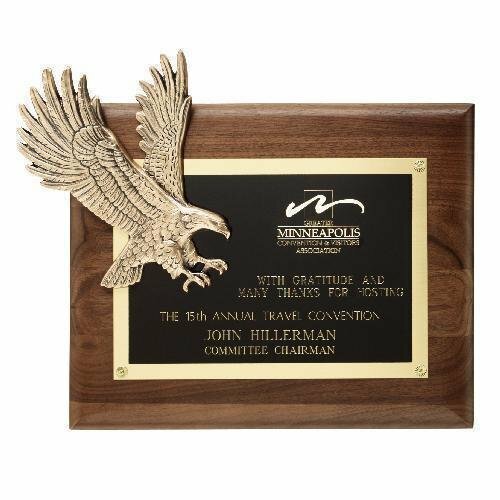 Walnut finish plaque features black brass plate and cast eagle landing with antique bronze finish. 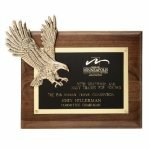 Pure K9 premium optic crystal award with double panels. Purple crystal overlay on another piece of clear crystal. Available in two sizes. Pure K9 premium optic crystal award. A stylish red crystal base accompanies this triangular shaped award. Available in two sizes.